Greetings everybody. Today’s “Observations” is dedicated to H. B. and Leslie Rew. I’m going to miss you two for the next three months. Be safe and warm down there in Florida. Lin handed me a pencil sketch of a warrior girl without a face. I stared at the swirling hair that draped the cheeks and taunted the tip of a samurai sword. I searched for the eyes, but they were missing. The figure seemed alive, vibrant, dangerous, but the silent face haunted me. Beneath the dancing lines, Lin had written a few words in Mandarin, little boxes of faint lines etched in a similar silence, caged sighs I couldn’t hear. Lin is a Chinese student who speaks in broken English. She is very quiet and shy. She hides in a swirl of gregarious American kids who seldom notice her at all. I was surprised when one day she walked demurely up and handed me a piece of paper with her drawing. That was when I looked into the faceless warrior girl and wondered. I praised her for the gift and complimented the artistry of the nameless figure. She merely smiled and walked away. The next day she handed me another drawing, this time it was a Fairy-like creature with graceful arms and no face. As I watched her walk away down the hall, I wondered if she was the girl in the drawings lost in a dangerous world, hidden behind a halcyon face, homesick. I hope you all are still remembering the one word I emphasized in Sunday’s sermon: Immanuel. As I told you, I think it is more powerful than the 8th most memorable movie quote (according to the Film Institute). That quote would be “May the Force be with you.” Han Solo had a good one there, but Luke has him beat. Immanuel is more than a single word as you can see here in the Hebrew words עִמָּ֥נוּ אֵֽל׃. Luke the Gospel writer had to translate it so his readers who didn’t know Hebrew would understand. He says it means God is with you Μεθ’ ἡμῶν ὁ Θεός. And that is so much more relevant than any movie quote! I thought our Candlelight service was so poignant. We had close to 100 people there and when the evening ended everyone walked in an exuberant but hushed tone down the center aisle and out the door holding candles, our symbols of hope and love. I want to thank Bob Coniglio, the Episcopalian pastor from Cape Charles, who shared the pulpit with me. Alex McCullough (Reserves), Michael McCullough, Kenny McCullough (Afghanistan), Ken Blair, Ed Eder IV, Sean Campbell, James Griffith, Thomas Johnson and all members of our military. Well, that’s all for this week. Don’t forget to pass on this sign-up link to anyone who might like to receive the newsletter. http://eepurl.com/csTu5T. American Film Institute’s100 Movie Quotes is a list of the top 100 movie quotations in American cinema. This quote is Number 8 on the list. (#1 is «Frankly my dear I don’t give a damn.» Clark Gable in Gone with the Wind). I would like to suggest that a far more powerful and life changing quote is the one in our text this morning: «. . . and they shall call His name Immanuel, which is translated, God with us. There are many who are in need of encouragement at this time of year. They don’t need a Christmas present; they need His Christmas presence. They need to be reminded of what this season is all about. It is not about things. It is not about presents. These things have their place, but we need to remember the essential message of Christmas, which is Immanuel—God is with us. And for the hurting person, the lonely person, the sorrowing person, this is the time of year to bring the gift of encouragement to them and say, ‘The message of Christmas is: God will be with you. God will help you. God will strengthen you’. 1. God is with us when trouble strikes. I remember standing in the little prison at Philippi many years ago. It was there that Paul and Silas sat in the dark, their wounds bleeding from the whipping they had received. But Immanuel was there. God was with them. He was with them as they sang hymns of worship. He was with them when trouble struck. He will be with you when trouble strikes in your life. That is the true meaning of Immanuel. 2. God is with us in our despair. Medical doctors remind us that Christmas time can be a time of despair for many people. Perhaps this is because the season itself is a busy one with high expectations for happiness. And in this rush to do so many heroic things, we begin to find the load upon us growing heavier and heavier. We are supposed to be happy like everyone us, but that doesn’t always happen. Despair sets in and then guilt etc. *I am reminded of Charles Dickens. When he was 12, his father suffered several embarrassing financial setbacks and young Charles had to go to work in a shoe polish factory called the Blacking Warehouse. I have a picture of him slumped over a lonely desk, his face buried in his forearm, his hands black with polish, his heart filled with sorrow. He had been removed from school, from his happy life, and his country home. The family now lived in squalor and his father was hauled off to jail for failure to pay a $50 pound bill to a local baker. This experience haunted him for the rest of his life and led his writing the Christmas Carol, which in his day was read only second to the Bible itself. *Even David had moments of despair and depression. But in the midst of all these dark clouds that often swirl about our lives even in the happy seasons, we can hear this one word whispering hope to us. Immanuel–Imannuel. Can you all say it with me? IMMANUEL–God is with us. Just the sound of the words gives us hope. Hamid strolled into my Civic’s class at the end of the bell as if time was a foreign word. I stopped what I was doing. “Hamid, you’re late again. Really? How are you going to pass this class if you’re never here?” He just shrugged, all 250 pounds of him, his hair mussed, his dirty tee shirt torn and draped over thin jeans with several patches covering past sins. He looked like an Appalachian mountain man out for a Saturday stroll through the foggy hollows. In reality, Hamid was from Iran. He had arrived in this country a few years ago but still seemed like he was in culture shock. He had a budding beard and an infectious smile. Nothing bothered him too much. He told me again why he was late. “My mother was sick and I had to watch my little brother and then I had to walk all the way to school.” He spoke several Iranian dialects and was clearly quite smart, but he didn’t know sentences needed periods or that time schedules meant something. “It’s all right, Hamid. I’ll help you catch up,” I said scratching my head. He just grinned and sashayed off to his Algebra class already thirty minutes late. As I stood in the pulpit gazing out at the congregation last Sunday, I noticed a strange stirring in the back. It seemed at first as if a quiet wind was blowing through a weeping willow. Wisps of greenery were swaying and dipping just below the pew tops. I rubbed my eyes wondering if this vision was heaven sent or just my imagination. Then a little elbow wiggled followed by the soft footsteps of Revel rounding the corner at the back of the church hoisting a portion of some garlands that decorated the sanctuary for this Hanging of the Greens service. He was a miniature pied-piper marching forward into a story he was living leading his followers with gusto and frivolity. I couldn’t help but chuckle and imagine what the heavenly hosts thought as they peered over heaven’s banner watching. The pipes almost hypnotized me. I sat motionless, just staring and feeling a sense of awe. There’s something inspiring about organ pipes. They set a mood, they summon us to a high and lifted place where our hearts can gather and commune with the Divine. 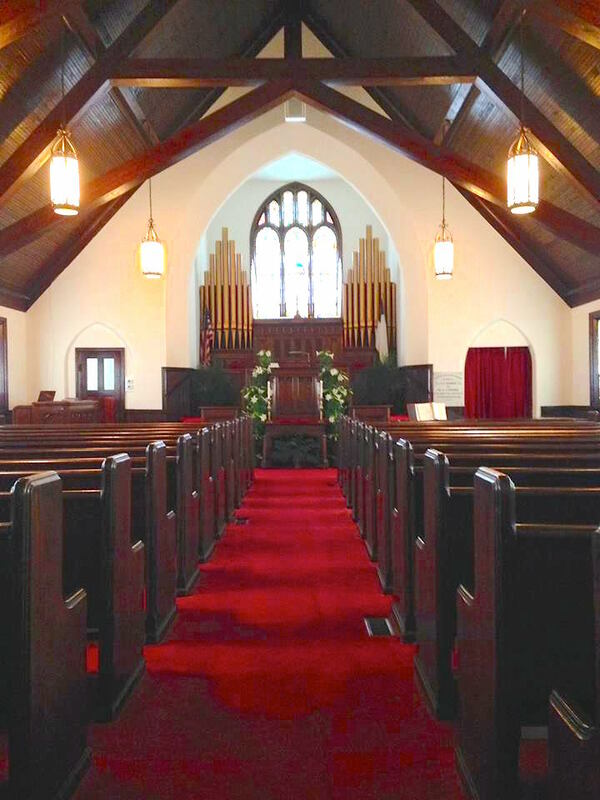 It’s not often I get to sit in the back pew, but during an interlude in a recent service, I was there in the back just gazing at the choir loft and listening to the immense, golden pipes breathe. I have a genuine appreciation for the architecture of our sanctuary. Few churches have these treasures that adorn our worship space. The pipes, the stained glass windows, the arched ceiling–all of these icons of modern worship lead all genuine searchers forward to the throne where those seek truth can commune with God and find respite from a corybantic world. I bid you farewell until next time. If you like this newsletter let me challenge to forward it to a friend so he or she can sign up for this weekly, inspirational missive. Just paste this signup link http://eepurl.com/csTu5T into your email and your friend can click it and subscribe to the newsletter. (p.s. Follow this link to my website (www.Blaktiepress.com) for more items of interest). I preached Sunday on the short text, “For nothing will be impossible with God” (Luke 1:37). I wanted to show you what this looks like in Greek. Ready? v. 37 ὅτι οὐκ ἀδυνατήσει παρὰ τοῦ Θεοῦ πᾶν ῥῆμα. When you stand very close to God–right up next to him like he’s your closest friend–every word He speaks to you will not be burdened with hints of impossibility. I just thought you might like to hear some of the Greek music I hear when I read the Greek of this verse. In other words, all of God’s words to us are possible–never impossible. After the service two weeks ago, I stepped down from my lofty perch and began talking to Danielle, an older woman who always sits closest to the front. As we talked, she told me something I could hardly believe. She said she used to be a teacher in Virginia Beach and that she had taught for one year in my very school–Lynnhaven Middle School. “What did you teach?” I asked her a bit nonplussed. She replied, “I taught Latin.” And that’s when I realized just how small this world really is. Thanks, Danielle. Latina est gaudium. www.Blaktiepress.com. Just click a blog link on the right (or left) and leave me a message.